This blog is always a bit delayed. We’re actually already in Maui and have been in San Francisco for the last week – and yet I am still writing about things that happened last month in Bangkok! Anyhow, our flight over on EVA Airways, a Taiwanese airline, was smooth. Our airplane in San Francisco after our arrival. Temperatures were cold and breezy, as only a San Francisco summer can be! 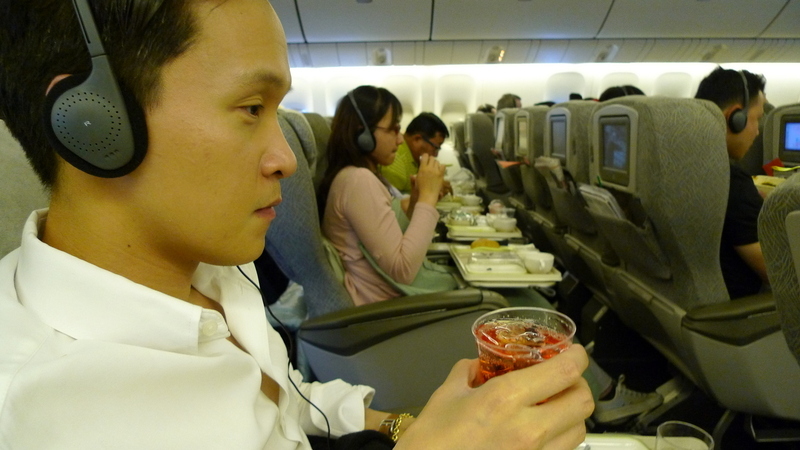 Flight over – “Elite” class, which is EVA’s premium economy cabin. Airfare is higher this summer than when I traveled over this past December. Nonetheless, I’m at an age (and height) where a little extra space makes the trip much more enjoyable. 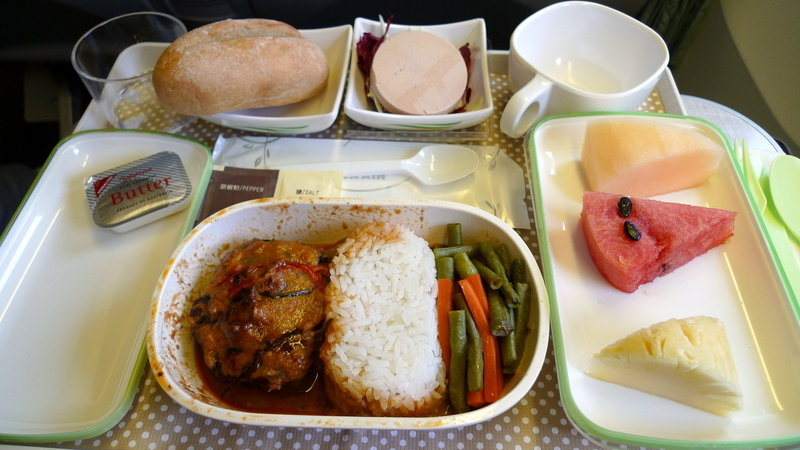 While EVA’s food is generally good, this flight’s food was exceptional. Out of Bangkok, I had a Penang curry beef dinner with a duck pate over salad, fruit, and ice cream for dessert. 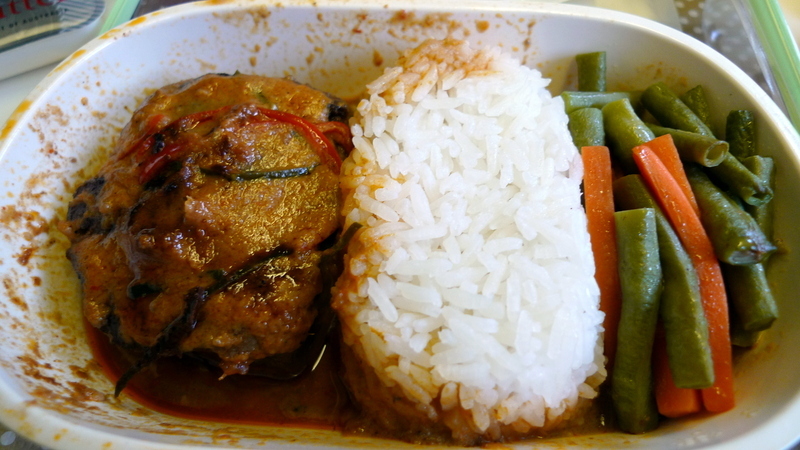 Closer look at the beef curry – instead of small pieces it was a petite steak. Very flavorful. 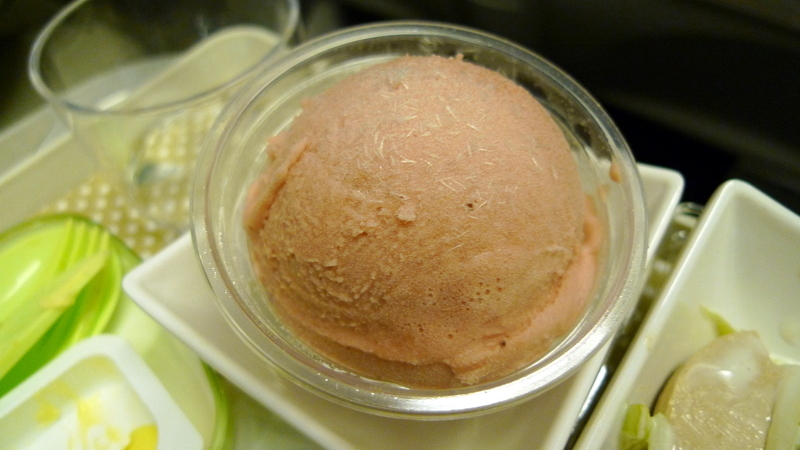 Strawberry ice cream, complete with little strawberry seeds. Of course, it arrived frozen so solid that I had to wait ten minutes to be able to make even the slightest dent in it! 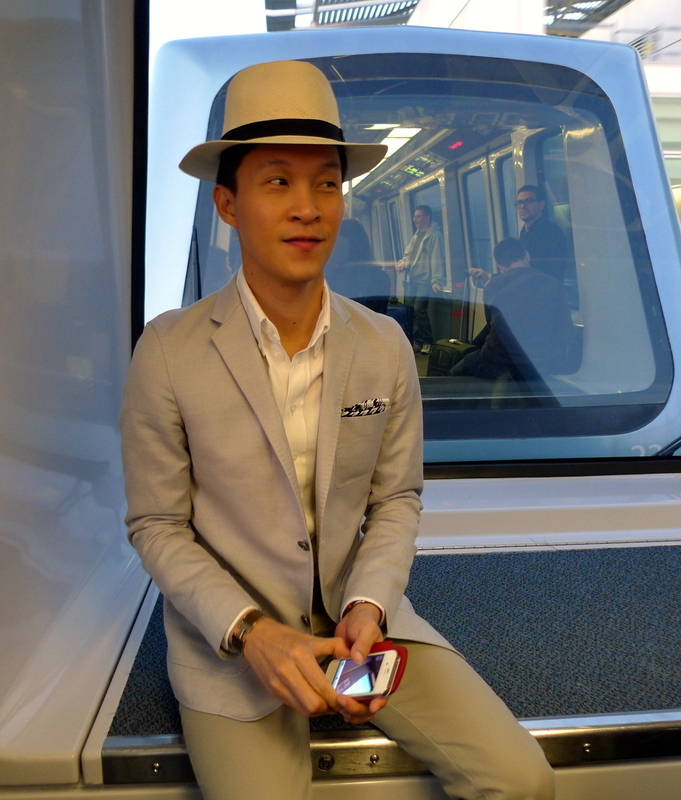 Tawn on the air train to the car rental facility in SFO. Because we arrived in the early evening, there was no wait at immigration and customs. We breezed through immigration in less than three minutes and the bags started arriving within fifteen minutes of getting off the plane. In fact, we were in the rental car driving away from the airport within an hour of landing. Pretty impressive! This entry was posted in Uncategorized and tagged airplane, EVA, travel by christao408. Bookmark the permalink. Looks like a comfortable flight — and yummy food! I hope you were just as stylish as Tawn. Shouldn’t your long time subscribers be entitled to real time updates? It does look like it was as such, indeed, which is great. May all of the trips, flights, and the like, be filled with comfort. Tawn dressed very stylishly – does he demand the same of you lol.I am surprised by the food served. Interesting to hv a Penang style curry in stead of a Thai style curry out of BKK, anyway enjoy ur stay in Maui! It seems that the joy or agravation of a holiday or excursion is often based mostly on the travel experience just getting there. It’s like going to Disney World in a cattle truck…….the Disney mouse ain’t gonna be worth the trip. Traveling again?! I hope this time is for pleasure and not necessity/work! Glad to hear the travel is going smoothly and that you’re both safe. Our best to the bride and groom. See you soon. Glad to hear you had a comfortable journey. I always admire Tawn’s dashing travel outfits. Do you find Eco Premium worth? I once took it on AF and was a bit disappointed. i think tawn looks WAY too posh for SF. i mean, have you seen the hippies there? tawn belongs to LA. specifically, the beverly hills 😉 -peace- ps: i too enjoy the eva air.